The Wedding Bees by Sarah-Kate Lynch, the author of the bestselling Dolci Di Love, is a delightful novel about love and loss, heartbreak and hope, and the magic of honey, in the vein of Amélie and Chocolat. 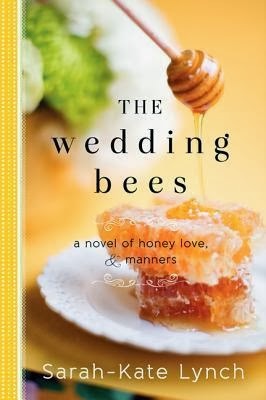 The Wedding Bees has one of those covers that just immediately says; read me! And any book set in New York has me reeled in, regardless. I don't read that many Adult books, but when I do, chick-lit and contemporary is the one I am drawn to, so many thanks to HarperCollins360 for allowing me to get my Chick-Lit fix for January! Sugar is running from her past, and has been for quite some time, never taking more than her cherished bees. She's nothing but enchanting and well mannered wherever she goes and never fails to have the neighbours and people of wherever she goes becoming her lifelong friends. Although, she never stays long enough. She's always moving on to the next place, guided by her prized bees. So I was enthralled as to her heart leaning toward a deeper connection to her arrival in Alphabet City, as she becomes attached to the people and possibilities the city has to offer. I could easily see Sugar's charisma and grace acted out on the big screen, and I would be first in line. The Wedding Bees is unlike any other, alluring and riveting in every way possible. The introduction to Sugar is inviting, but toward the middle is when we delve into the storyline and back-story a little more, giving us a more open-eyed view to Sugar's past and her potential here, guided by only her bees, which gave me a feeling that she was a very hesitant person. Even at the start, her oldest friend thinks she's gone a little crazy, but when everyone gets a glimpse through her contrasting view of the world, they start to understand Sugar in all her inimitable ways. Sugar Wallace was as sweet as honey. She was an idyllic lead heroine and I was captivated by her unique quirks and charming southern appeal. She was definitely my favourite character of the book and I rooted for her the whole way through. Her stories of South Carolina were a lovely addition and just the way of how she was, as if she was enraptured by life itself meant she was an absolute delight, overall. There were many characters along the way that sparkled like Sugar did, alike her romance with Theo; the Scottish love interest of hers. Their meeting and connection was undeniably sweet the way Sarah-Kate Lynch weaved their paths together, I knew they were going to have chemistry. And the others along the way, like; Ruby, Nate, George...there were so many that shone throughout the story and fitted in without the pages feeling cramped with characters. The Wedding Bees is whimsical, fascinating and an almost magical-type of Love Story set in one of the most coveted and lively places on Earth; Manhattan, NYC. I fell in love with the characters, the honey and the bees and the feel-good realistic elements. It had everything in a novel I love, filled with imagination and sweet, memorable features. Sarah-Kate Lynch deserves every five-star review for this amazing read! Have you read The Wedding Bees?